Baby Monitors are an extra pair of ears or eyes when it comes to looking out for baby. Baby Monitors allow parents and caregivers to keep tabs on a sleeping baby while working around the house or even outdoors. Although a baby monitor allows parents and caregivers more freedom and flexibility, it is important to remember that it does not replace adult supervision. Baby Monitors are actually a set of small radio transmitters: a base transmitter that is placed in the nursery near your baby and a receiver transmitter that is carried along with you. It is important for you to test and establish the operating range of the monitor by testing the unit in different room combinations, as obstructions caused by terrain and walls, and interference from other devices can cause static and unclear reception. If you’re living in a densely populated area or high-rise apartment building, you’ll want to look for models that offer more than one channel so that you can change channels when you get interference from a neighbor’s portable phone or remote-control toy. On the other hand, if you know you’ll want to be outside working in your garden or going longer distances with the receiver portion of your monitor, you’ll want to get a high-range baby monitor (i.e. 900 MHz). Baby monitors operate on batteries, electricity, or a combination of both, and many are rechargeable and do not need batteries. Audio monitors transmit sound only. They may have multiple channels to minimize interference, a low-battery indicator, and volume control. Some baby monitors have a portable receiver that can be clipped on and taken wherever you go. Video monitors allow you to actually see and hear your child on a TV screen. Some monitors utilize infrared technology that allows you to see the nursery, even in total darkness. Sound-and-light audio monitors have a special LED display that allows you to view the sound level. In addition to standard features, most have an out-of-range signal light, too. Intercom monitors allow you to communicate with others in the house with just the push of a button, as well as transmitting baby’s sounds. 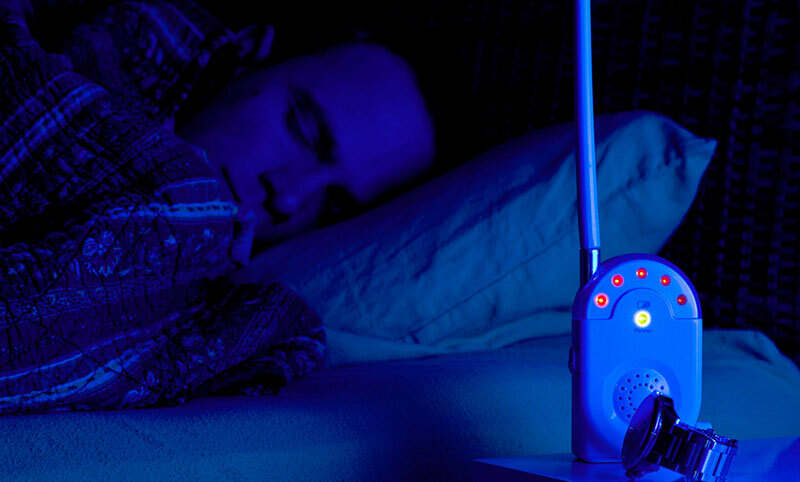 Some feature sound lights that let you “see” when baby stirs. Do not use a baby monitor to justify leaving your child alone while playing. Parental supervision is essential. Do not place near water. As with any electrical gadget, baby monitors present shock hazards if misused. Always follow manufacturer’s instructions on placement and usage of baby monitors. Handle monitors with care. Do not carry the device by the antenna, as they are fragile. Protect monitors from direct sunlight or heat sources. Remember to place the monitor up high where other children cannot disturb it.